This quick and easy recipe for chewy, sticky florentines is absolutely foolproof. Whip up a batch for a party or make as edible Christmas gifts. Heat the butter, sugar and flour in a pan over a medium heat, stirring continuously, until the butter has melted and the sugar has dissolved. Gradually add the crème fraîche, stirring continuously until well combined. Add the almonds, candied peel, stem ginger, and sour cherries and mix well until combined. Line a baking tray with greaseproof paper and place teaspoonfuls of the florentine mixture onto it. Space the teaspoonfuls out at 2.5cm/1in intervals so they don't merge together when heated. 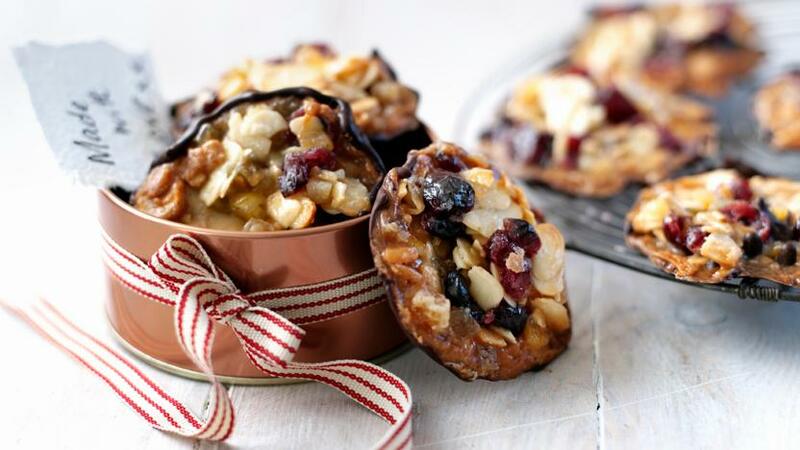 Transfer the florentines to the oven and bake for 12-15 minutes, or until golden-brown. Remove from the oven and set aside to cool on the tray, then transfer the florentines to a cooling rack. Turn the florentines so that the flat base is facing upwards. Spread the melted chocolate over the florentine bases and set aside to cool and set.